Proforme Ram Arm Electric gate automation kits. BFT P7 - P4.5 (hydraulic) Arm Kit . Heavy duty hydraulic motors for large and heavy swing gates with a slow action for larger gate leafs. BFT Lux (hydraulic) Arm Kit . 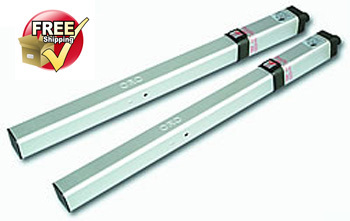 Heavy duty hydraulic motors for swing gates with a heavier design for larger gate leafs. BFT Oro (electro-hydraulic) Arm Kit. Electro-hydraulic gate mounted motors for use with residential swing gates. BFT Phobos (electromechanical) arm kit . Either 240V or 24V low voltage electro-mechanical gate mounted motors for use with residential swing gates. CAME Krono (Electro-Mechanical) Ram Arm Kit . Mechanical motors suitable for domestic applications from 3m to 5m each leaf. 400 to 1000kgs per leaf. CAME Amico (Elecro-Mechanical) Arm Kit . Mechanical motors suitable for applications from 1.8m to 6m each leaf. 240 & 24v 200 to 250 kgs per leaf. CAME Ati (electromechanical) arm kit. Mechanical motors suitable for domestic and light commercial applications upto 5m each leaf. 240 & 24v 400 to 1000kgs per leaf. Mechanical motors suitable for domestic and light commercial applications upto 7m each leaf. 240 & 24v 300 to 1000kgs per leaf. NICE Toona (Electro-Mechanical) Arm Kits. Mechanical motors suitable for industrial & domestic applications from 3m to 7m each leaf. 240v & 24v 350 to 1700kgs per leaf.